An angler can go crankbait fishing almost any time of the year and expect to be successful. They come in every size, shape and color you can imagine. Ok, not every size but I have seen a few about six inches long! This lure is supposed to resemble a baitfish such as a shad, a minnow or a small bream. Crankbaits have long or short lips or no lips at all. Most have a treble hook on the tail end and one on the bottom. There is one company that makes a Backstabber brand with the hook on top and not the bottom. This design avoids snagging when they bounce off a stump or log. You can find these at the Tackle Warehouse. How do you fish a crankbait? The instructions in my head say tie it on and sling it. Somehow I don’t think that works for everybody. There are different ways to fish this lure depending on whether you are fishing deep or shallow water. Use crankbaits with a long lip. Use a rod 7 to 7 and 1/2 feet long to cast a long distance. Casting a long distance(30 yards or more)allows the lure more time to get down into deeper water. Use a graphite rod, which is more sensitive than a fiberglass rod. A sensitive rod allows you to feel the slightest bump against any structure or a bass hit. Use a medium speed baitcasting or spincasting reel. Use 10 pound test line which has a smaller diameter than 17 pound test line. A smaller diameter fishing line will cut through the water at a faster rate and allow the crankbait to go deeper. But using a small diameter line might not be the best option, depending on where you are fishing. If you are fishing heavy structure in deep water it would be better to use a 15 to 17 pound test line to be able to pull the big bass out of the cover without breaking the line. Use crankbaits with a medium length lip. Use the same rod and reel rig. Stay with a 10 pound test line or go up to 17 pound test line if you prefer. You could stay with the lure with the long lip and see how that works but you need to use a slower retrieve. A slower retrieve would be needed to keep the lure from constantly digging into the bottom. Fish a crankbait this depth in after a cold front. The bass are going shallow water to feed on shad to store up fat for the winter. Use crankbaits with a short lip. Use a 6 to 7 foot rod because you don’t need to cast long distances to get the lure down deeper. But of course use any length rod you prefer. Use a 10 to 17 pound test line in this depth of water. Use a spinning reel or spincast reel and 10 pound test line if you want to go with lighter bass fishing tackle here. Be sure to use a lighter weight lure also. Use 15 to 17 pound test line if you are fishing heavy cover in shallow water. Ok you got your nice new crankbait and you are fishing around tree tops or a stump field in about 10 feet of water. Cast past the tops or stumps and retrieve the lure to get it down around the structure. When you are retrieving the lure try to bump the lure off a limb or a stump. Pause for just a second and then start retrieving again. Maybe slow your retrieve just a little after you bump the stump. But the important key is to deflect the crankbait off something! Mike Auten, a veteran pro, explains this method in the book ADVANCED BASS FISHING SKILLS. Now let's take a look at the lipless one! 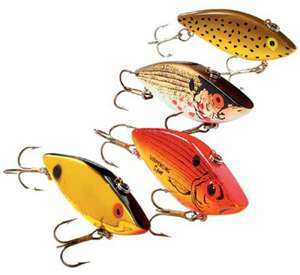 This crankbait is almost always called a Rattle Trap or Rat-L-Trap. This lure rattles during the retrieve because it has small metal balls inside the plastic body that bang around. There is one other thing that makes this lure different from other crankbaits. It sinks instead of floats. You don’t have to drag it down into the deep water. When sinking into deep water it resembles a wounded shad with a fluttering, irregular motion. By varying the speed of your retrieve and making the lure jerk from side to side you can catch the attention of any bass in the area. As with any lure, it just takes a little practice and patience. Keep a wide variety of crankbaits in your tackle box. Keep different colors and different diving depths for any time of the year. Chrome/blue and chrome/black are some good choices for the fall. Red imitates a crawfish in the spring. If one lure is not working try experimenting with different colors and sizes.